Here is my take on the most famous peanut butter/chocolate candy of them all. It is a best seller in the bakery, as well as one of the staff’s favorites. Prepare the Peanut Butter Base Dough, adding the peanut butter chips along with the dry ingredients, and mix to just barely blend. While the dough is still streaky, remove the bowl from the mixer and scrape the paddle clean. When ready to bake, preheat the oven to 325°F. Line two baking sheets with nonstick silicone baking mats or parchment paper. (Alternatively, use nonstick baking sheets or lightly butter conventional baking sheets.) Set aside. Place the peanuts on a large flat plate. Remove the dough from the refrigerator and unwrap. Using a tablespoon or small ice-cream scoop, make mounds of dough. Roll the dough into balls about 1-1/2 inches in diameter. Working with one at a time, roll each ball in the peanuts to lightly coat. Place the balls, about 2 inches apart, on the prepared baking sheets. Using your palm, gently flatten the top of each cookie. Using your thumb, make an indentation in the center. Place a chocolate chunk (or a few pistoles) in the indentation. NOTE: Chocolate pistoles are small, flat, chocolate disks used by professional bakers and candy makers. They are available at most specialty food shops and cake and bakery supply stores, and on the Internet. Peanut butter cookies were my favorite teenage project because I thought the raw dough was as delicious as the cookies and I could snack on it during the making and the baking! I also loved scoring the cookies with a fork making sure that each was marked perfectly. The Milk & Cookies Bakery recipe is peanut butter perfection. The cookies are not so dry that they crumble when you pick them up nor so moist that they stick to the roof of your mouth, like their main ingredient. 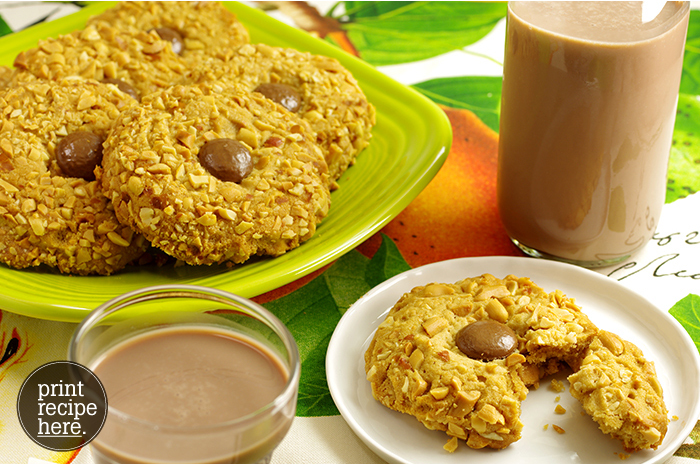 We use natural-style peanut butter without added sugar so the cookies have a true peanut taste. After much experimentation, we now have the flawless combination of texture and flavor. Combine the flour, baking soda, baking powder, and salt in a mixing bowl. Set aside. Put the butter in the bowl of a standing electric mixer fitted with the paddle. Begin beating on low speed. Add the brown sugar, increase the speed to medium, and beat for about 4 minutes, or until light and creamy. Add the peanut butter and beat to incorporate; then, beat in the eggs, one at a time, scraping down the sides of the bowl with a rubber spatula after each addition. Beat in the vanilla. With the motor running, gradually add the flour mixture, beating just to blend. While the dough is still streaky, remove the bowl from the mixer and scrape the paddle clean. Continue as above.